Welcome to our website! Enjoy browsing and we hope you get in touch and come along to our events, most of which are held at the Liberal Jewish Synagogue (LJS), in St John's Wood, London. We have a new logo and have changed our name to Jewish LGBT+ Group with the strapline formerly JGLG. ​The Jewish Gay and Lesbian Group (JGLG) was founded in 1972 when a small advert in Gay News attracted the astonishing total of 190 people to a public meeting called to set up the new organisation. Since then the Group has gone from strength to strength and we held a wonderful event to celebrate our 44th anniversary in 2016. We are the longest established Jewish LGBT group in the world. Our membership is open to Jewish men and women who are lesbian, gay, bisexual or transgender including people from many different backgrounds. 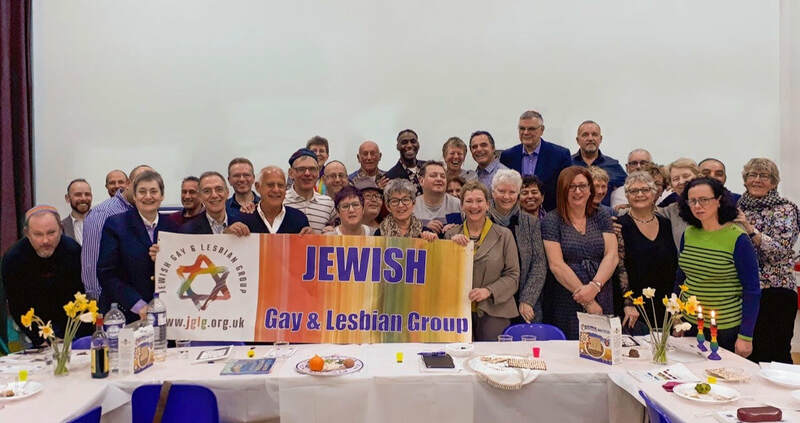 We welcome non-Jewish partners to all events and non-LGBT & non-Jewish guests to certain events, and although the group is based in London we have many members living across the country. We are primarily a social rather than religious group, and most of our religious events tend to follow Progressive/Reform traditions, although we have members from all branches of Judaism. We hope you will look upon JGLG as an alternative family for Jewish lesbians, gay men, bisexuals, transgender, their lovers, friends and relations, and look forward to welcoming you to our events.